Today three men are one step closer to freedom after being wrongly incarcerated for 18 years. Derrick Wheatt, Laurese Glover and Eugene Johnson had their convictions for the 1995 murder of Clifton Hudson Jr. thrown out after nearly a decade of legal advocacy from the Ohio Innocence Project (OIP). Judge Nancy Margaret Russo, Cuyahoga County Court of Common Pleas, threw out the conviction, granted a new trial and set bond. The OIP expects bond to be met today, which will result in their clients' immediate release. Their impending freedom comes after a key eyewitness recanted her testimony and the revelation that information from police reports that cast doubt on the defendants’ guilt had not been disclosed to the trial team years earlier. Today’s win marks the second triple exoneration for the Ohio Innocence Project, which operates out of the University of Cincinnati’s Rosenthal Institute for Justice in the College of Law. When the trio are released, the OIP will have freed 23 people on grounds of innocence, who together served more than 500 years in prison for crimes they did not commit. "We’re excited about today’s event, but even more excited for our clients," said Mark Godsey, the Daniel P. and Judith L. Carmichael Professor of Law and Director, Lois and Richard Rosenthal Institute for Justice/Ohio Innocence Project. "They have been fighting to prove their innocence for nearly 20 years. They had tried for exoneration twice before, and had come close in the past. OIP has worked on the case since 2006, and are happy to be with them as they finally taste their long-sought freedom." The OIP represented defendants Wheatt and Glover; Johnson was represented by attorneys Brett Murner and Jim Valentine. Additionally, co-counsel on this case was Carmen Naso, Senior Instructor of Law, and the law students at the Milton A. Kramer Law Clinic, Case Western Reserve School of Law in Cleveland, Ohio. 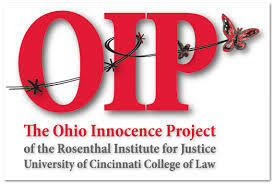 The OIP at UC and Kramer Law Clinic partnered on this case and plan to work together on additional cases in the future. "UC donors who contributed to the UC OIP’s tremendous success provided case workers with the funds needed to facilitate their pursuit of justice," said UC Foundation President Rodney M. Grabowski. "Since its founding in 2003, more than 600 donors have contributed more than $5.3 million toward the OIP’s efforts. We are forever grateful for their generosity." On Feb. 10, 1995, in East Cleveland, Ohio, 19-year-old Clifton Hudson Jr. was found murdered, shot multiple times. At the time, witnesses reported seeing a person wearing dark clothing and a dark hat at the scene. Three juveniles — Wheatt, Glover and Johnson — happened to be near the scene. But, they emphasized, when the shooting started, they sped off. All three later provided the police with descriptions of the shooter that matched the basic descriptions given by other witnesses. But in a twist of events, they were charged with the crime. A year later in 1996, the three were convicted of Hudson’s murder, based on their presence at the scene and identification by Tamika Harris, then a 14-year-old. Harris originally reported to police that she saw the shooter get in and out of the defendants’ truck; but, she insisted, she never saw the shooter’s face. It was this tip, though, that led to the group’s initial arrest. At the trial, Harris changed her story, admitting that she never saw the shooter actually get in or out of the truck. She testified, however, that she could positively identify Eugene Johnson as the shooter. Additionally, the prosecution found what it alleged to be gunshot residue on Wheatt and Johnson. They offered to completely drop charges against Glover if he testified against his friends and also offered Wheatt probation for his testimony. Both refused and continued to assert their innocence. Unfortunately, they were convicted; Wheatt and Johnson were sentenced to 18 years to life in prison; Glover was sentenced to 15 years to life. Through the years the three men continued to maintain their innocence. Then in 2004, Johnson’s attorneys, Murner and Valentine, filed a motion for a new trial on the grounds that Harris had recanted her testimony. Now an adult and in nursing school, she admitted she could not see the shooter’s face from where she stood and that she never saw anyone get in or out of the truck. She relayed that when she went to the police station years earlier, the officers told her they had found the people responsible, showed her photos of the three defendants, and asked which of the three was the shooter. Harris said she picked the one whose jacket was closest to the one she saw: Johnson’s. Though the trial court granted a new trial on this basis, it was overturned on appeal, in part because of the alleged gunshot residue evidence. Two years later in 2006, the OIP accepted the case. Attorneys and fellows spent hundreds of hours reviewing evidence, interviewing potential witnesses and filing motions. In fact, Brian Howe, now the attorney of record, previously worked on this case as an OIP fellow. In 2009, OIP attorney David Laing filed another new trial motion based on advancements in knowledge about gunshot residue. Specifically, the type of testing used in 1995 is known to be particularly prone to false positives from other items, and is no longer used by the FBI. Further, recent studies showed the high likelihood of gunshot residue contamination from police sources, especially when the tests are not performed on scene or immediately upon arrest. This motion, however, was denied. Late in 2013 a break in the case came when the OIP received the police reports. The reports included information that was not raised at the original trial, including the existence of two witnesses who confirmed that the shooter came from a nearby post office lot, not the defendants’ truck. One of those witnesses even claimed he recognized the shooter as a sibling of one of his classmates. The reports also showed that unknown people in a different car had shot at the victim's brother just days before the crime, and that someone had threatened the victim himself the day before the murder. There was no known connection between any of those threats and the defendants. The OIP, on behalf of the defendants, filed another new trial motion on the basis that this information was never disclosed to the defense. A hearing on the motion was held on Jan. 29, 2015, led by OIP attorney Brian Howe and the Kramer Clinic’s Carmen Naso. "The evidence at the hearing was overwhelming," said Howe. "None of these men should have ever been convicted." "This has been a long day coming for Mr. Johnson, Mr. Wheatt and Mr. Glover," said Howe. "I know it must be an incredible feeling. It is particularly important and gratifying for me because I worked on the gunshot residue motions as an OIP fellow. It’s incredible to see all of our hard work come to fruition." Special thanks to the many individuals who spent hundreds of hours working on this case over the years. The list includes attorneys: Brian Howe, David Laing, and Carrie Wood; and student fellows: Shabnam Allen, Nicole Billec, Amanda Bleiler, Scott Brenner, Chris Brinkman, Chris Brown, Eric Gooding, John Hill, Matt Katz, Eric Kmetz, Amanda Rieger, Bryant Strayer, Queenie Takougang, and Brandon Brown, Amanda Sanders and Shaun McPherron, who spent significant time in East Cleveland last summer canvassing the neighborhood speaking to witnesses.